Whenever I think of something special for my kids, vegetable pulao is my first choice. 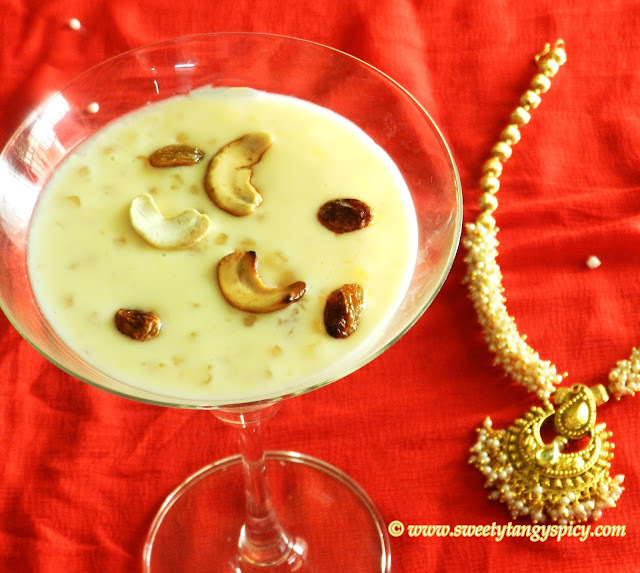 It is highly nutritious and healthy as it contains a lot of vegetables and nuts. Yes this recipe is the contribution of my close friend. 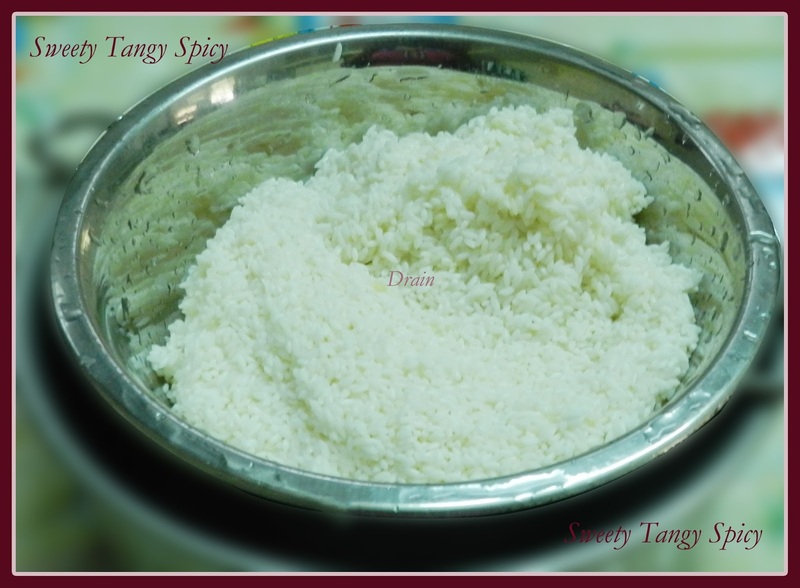 It is Very easy and tasty, try it out. Wash rice under cold water until water runs clear. 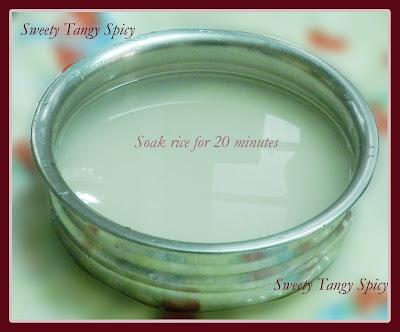 Then soak the rice in enough water for 20 to 25 minutes. After soaking time drain and keep aside. Crush cardamom, cinnamon, and clove and keep aside. Heat two half tablespoon of ghee in a pan and fry cashew until brown, add raisins, saute until it plumps up. Remove from ghee and keep aside. Heat two tablespoons ghee in a wide mouthed pan, saute whole spices like cardamom, cinnamon, clove and bay leaves till a nice aroma comes. Then saute onions till they turn transparent. 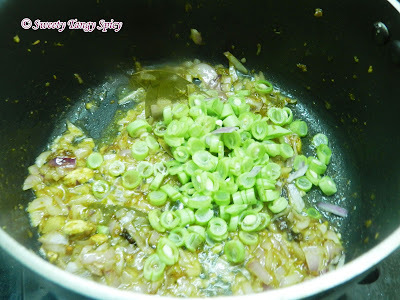 Add french beans and cook till half done. 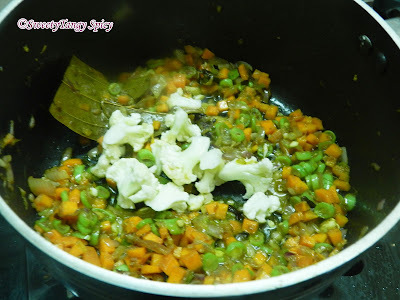 Add carrots and saute until its colour changes and became soft. Add cabbage and saute until transparent. 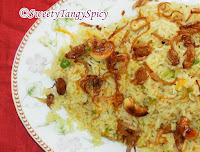 Then add rice and saute on high flame with continuous stirring until it crackles. Add the rice-vegetable mixture into the boiling water, add half teaspoon ghee, juice of half lemon, cover it with lid and cook on low flame till it cook well and all water evaporates. 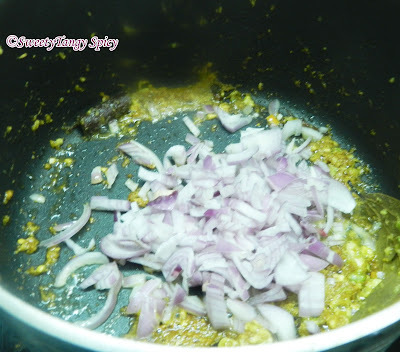 Add cooked green peas, brown onions, cashew, raisins, mix well. Keep it covered for 15 to 20 minutes. Serve with Chicken curry or any spicy gravy, raitha and pickle. Wash and soak basmati rice in water for twenty minutes. 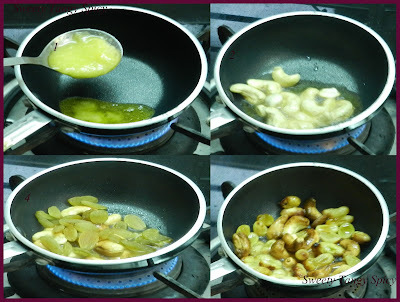 Heat two tablespoons of ghee in a pan and fry cashew until brown, add raisins, saute until it plumps up. Remove them from ghee and keep aside. 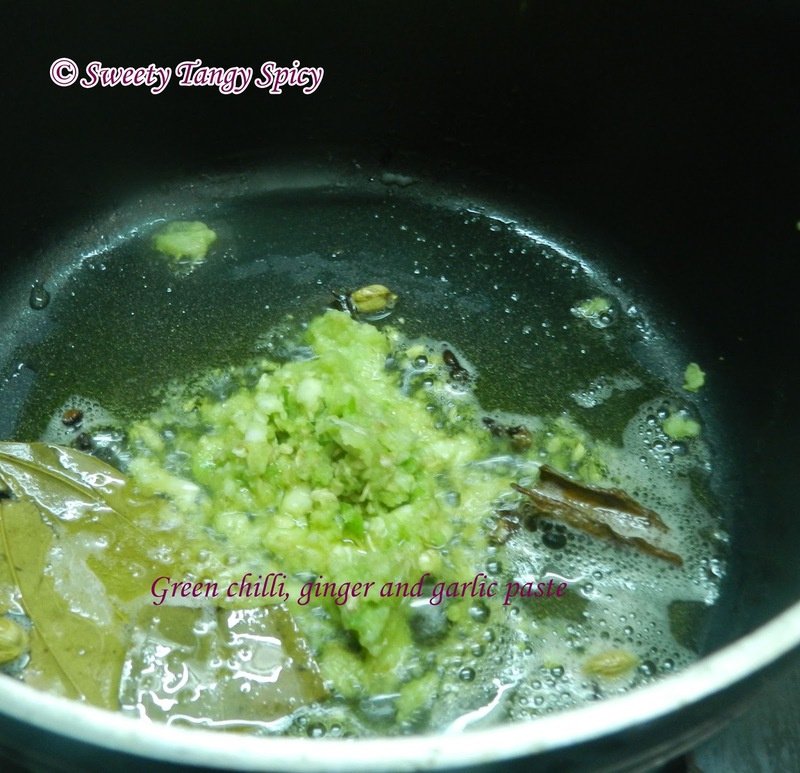 In the meanwhile crush green chillies, ginger and garlic in a mixer grinder. You can also crush with motor and pestle. 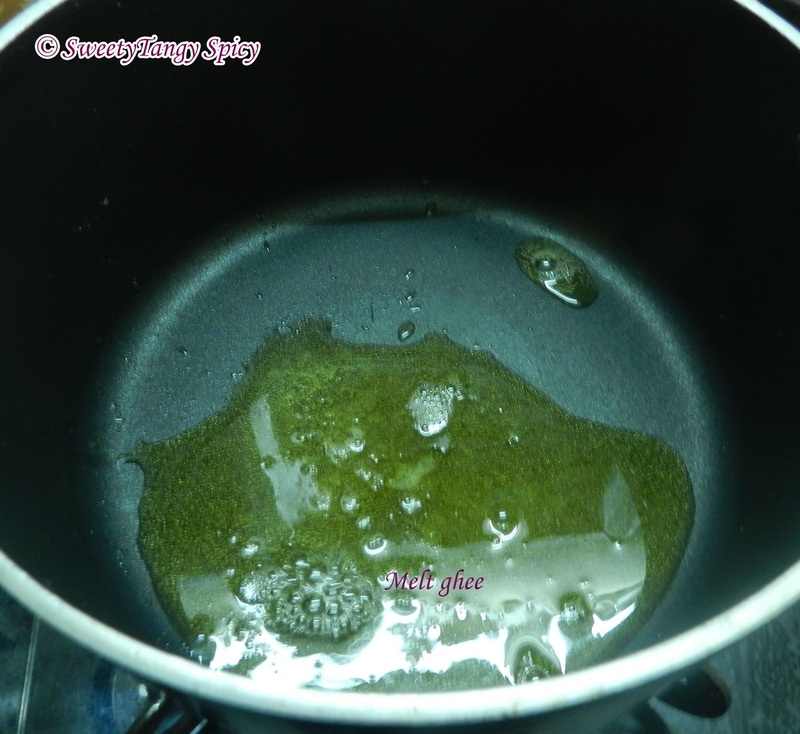 Heat two tablespoons ghee in a wide mouthed pan. 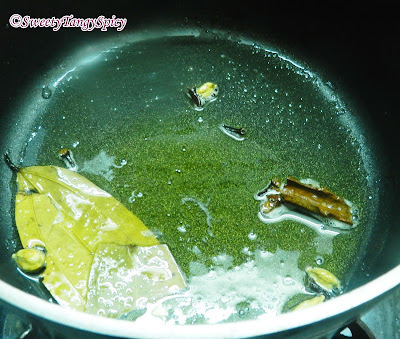 Add whole spices (2 cardamom, 4 cloves, 1' piece cinnamon and one bay leaf) and saute until you get nice aroma of spices. Add crushed chili, ginger-garlic paste and saute until the raw smell of ginger and garlic leaves. 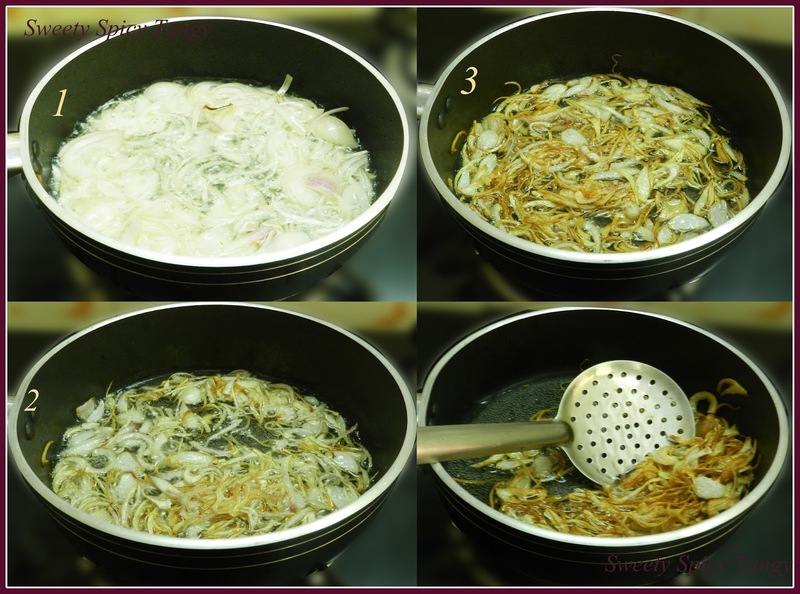 Add onions and saute till became transparent. 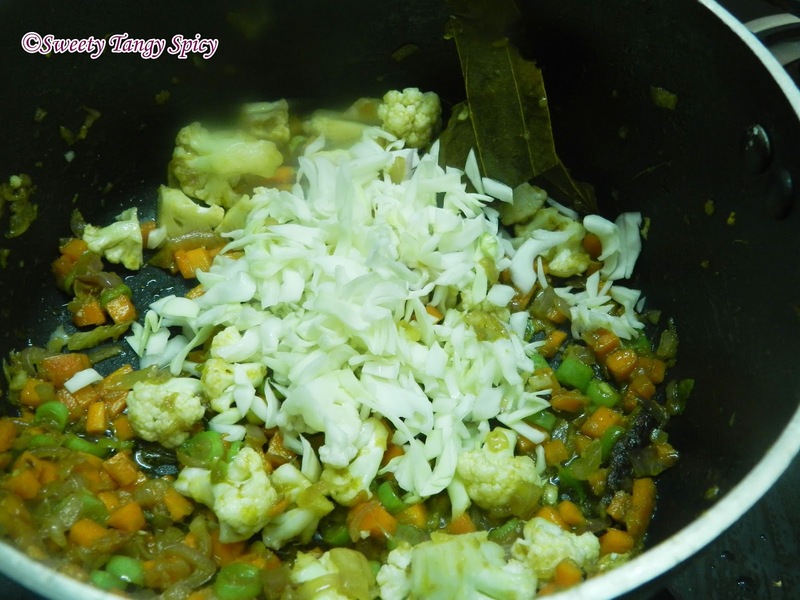 Add carrots and saute until its colour changes and become soft. Add cauliflower and saute for one or two minute. 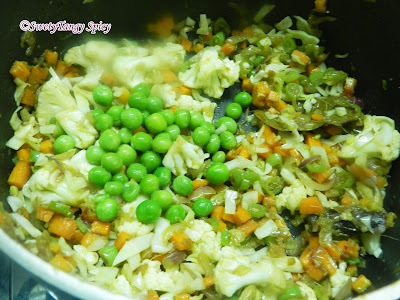 Add green peas and saute for one more minute. 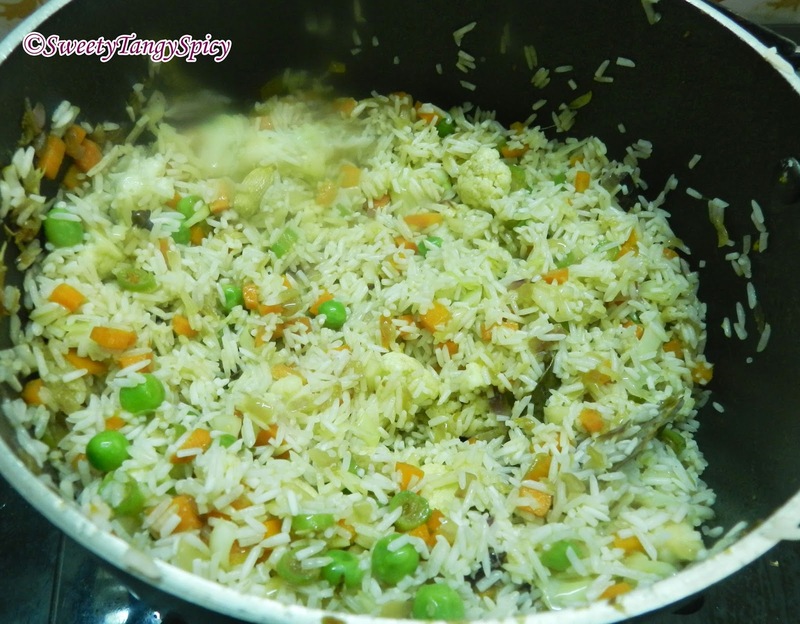 You can add steamed green peas at the end also when the pulao is still hot. Just cover it and keep for 10 minutes. Now add rice and saute on high flame with continuous stirring until crackles. Add three cups of hot water, salt, one table spoon ghee and 1 teaspoon lemon juice, cover with lid and cook on low flame until it cook well and all water evaporates. Garnish with brown onions, cashew, raisins, mix well. Keep it covered for 15 to 20 minutes.Serve with Chicken curry or any spicy gravy, raitha and pickle. Some tips for vegetable pulao. 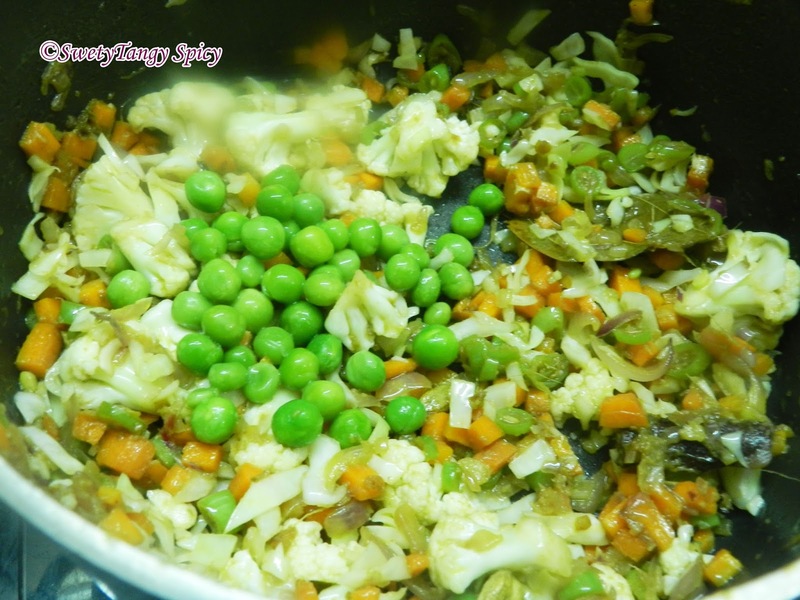 You can add green peas while sauteing the veggies. 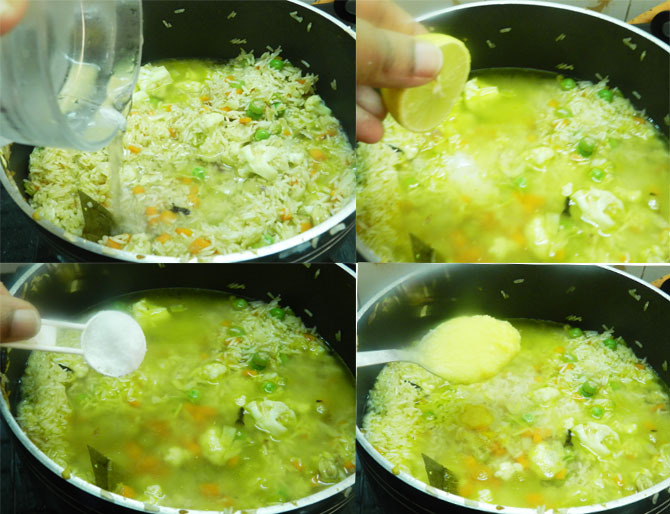 If you are using pressure cooker, add 1.5 cups of water per 1 cup of rice.